A vision board is a creation of images that express what a person wants in her/his life, or what makes one feel happy, passionate about life. I create mine on a bulletin board so that it can be a growing, shifting, set of images that reflects the changes happening in my life. Last fall, I had taken my Vision Board apart during a massive clearing and reorganization of my studio. I have wanted to create a new one for many months but it felt like too big a project to take on. When I got invited to a small gathering of women to create one on New Year’s Day, I was thrilled at the thought. I spent some time before we gathered locating images that appealed to me—for their meaning? No, because they were interesting, beautiful, or had some appeal that I could not give meaning to yet. In preparation for this Vision Board making, we smudged each other with sage. Dried sage is burned and the smoke created is fanned over and around a person by another. This is a Native American tradition that helps a person focus her intention and it clears away confusion. Making a collage is one of my most favorite activities. It’s an art form that involves images, and words, and colors and design and movement and unity and balance and space. I like to layer the images to give the artwork depth. 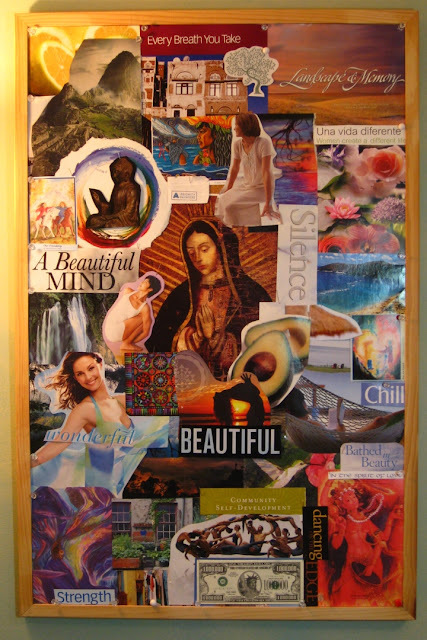 The Vision Board feels successful when I am pleased with how the end result looks. This often takes moving images or adjusting how they are put together to get the look that works for me. If I find another image has to become part of the Vision Board, I can add it easily by removing some pins and shifting images around. I love this Mary Lee - and especially the way you've created it on a bulletin board - that makes it very dynamic! Thanks for sharing your beautiful board with us.